We’re making it easier for you to find and follow your favorite accounts and creators on both Vine and Twitter. If you’ve connected your Twitter and Vine accounts, your Twitter account will appear on your Vine profile and other areas of the app. And a new Twitter setting lets creators choose to show their Vine account on their Twitter profile. Makes total sense since Vine is a Twitter property and the latter is needed to get full-on engagement for the former. This’ll help Vine stars gain new followers on both platforms. It also serves as a means of verification. Most of the time, when I see a Vine, I have no idea who made it and since I’m a native Twitter user, it would help to be able to follow them in both places if they’re making cool stuff. Assuming that you’ve connected your two accounts, your Twitter user name will pop up on your Vine profile and “in other places throughout the app,” the team says. The most helpful part is that if people search Vine for your Twitter name, you’ll now come up. Tap it, and then boom they can follow you. Twitter’s getting a setting to show and link your Vine account, but we haven’t seen it yet. Everything I just explained will work the other way. Another tweak that’ll make content creators happy is the vanity metric for Vine, Loops, will now be shown on your Vine profile. It’s basically what Twitter should do by showing how many times your tweets have been viewed in total (since Loops are how many times your 6-second clips have been viewed). It’ll help Viners get discovered by brands and those wanted to hire them for other work. 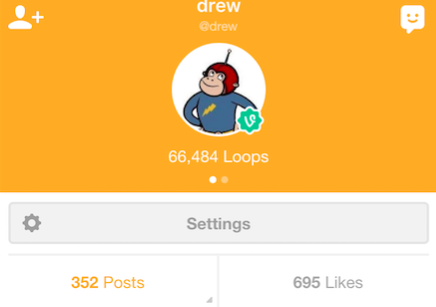 It’s all about da Loops, yo. The link between the two profiles also helps Niche, another Twitter property, package up Vine stars for promotional opportunities. It also pulls Vine stars away from pimping out their Instagram and YouTube links for more engagement. The changes are rolling out on Vine for iOS with Android “coming soon.” Twitter’s stuff is rolling out on iOS and Android.